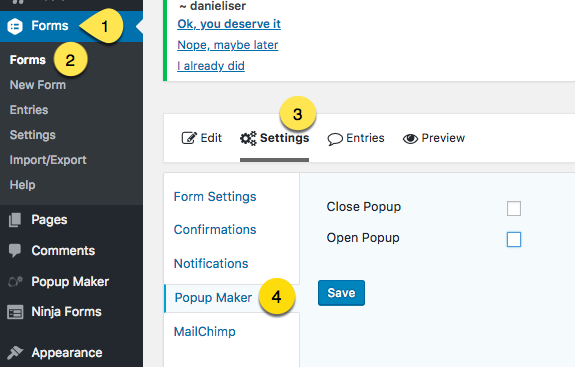 Each of the 3 form plugins that Popup Maker integrates with allow plugin users to set and display a 'success' or 'confirmation message' after form submit success. The success message is set and managed within the form plugin itself, not Popup Maker. Therefore, if the success message does not properly render on form submission, check the message settings within the form plugin Admin. Related article: Why is A Form Not Working In My Popup? Note: The related article link above addresses a use case where a plugin user attempts to display the same form on either a page, post, or widget, and inside a popup using the same shortcode tag and ID. That approach does not work. Read the related article to learn how to resolve this issue. 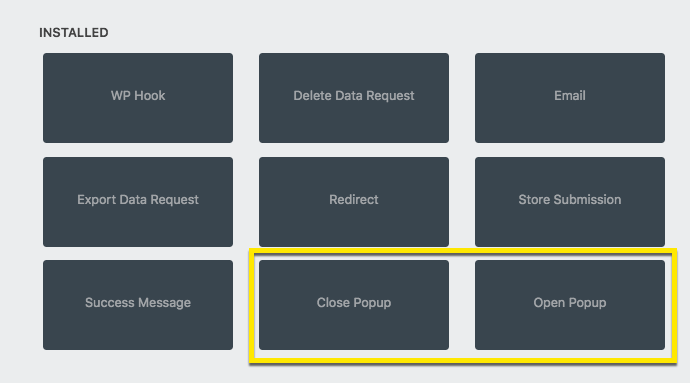 Popup Close ( or Close Popup ) -- Users can set a time delay on the closure of a popup after form submit success. The default value is 0, and increments in seconds. A delay of 3 - 5 seconds is usually enough time to allow a confirmation or success message to display within the popup and register with visitors. 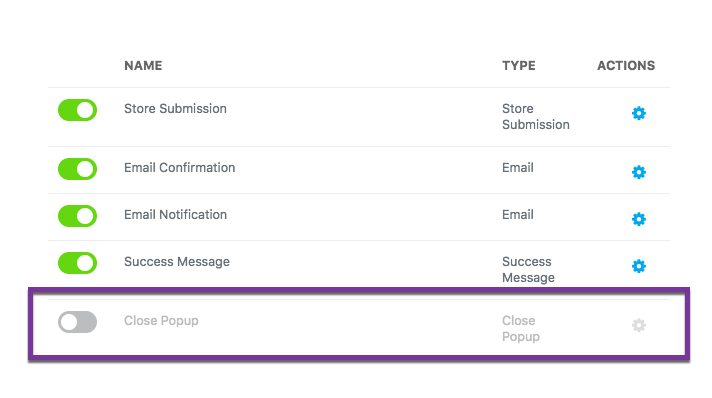 Popup Open ( or Open Popup ) -- Users can display a second popup after form submit success that contains a confirmation or success message. If a popup intended to serve as a confirmation message does not appear in the form plugin admin, check it's publication status. Only published popups are shown within the form plugin admin. 1) From the WP Admin, select the Ninja Forms admin menu. 2) Select the ‘Dashboard’ submenu. Select the gear icon to display the 'Edit' submenu beneath the form title. Select 'Edit' to open the form editing page. 1) On the form editing page, select the ‘Emails & Actions’ category. 2) Select the large plus symbol in the lower right-hand corner to open the 'Emails & Actions' option view. From the available actions within the view, select either the ‘Close Popup’ or ‘Open Popup’ option. 1) By default, the Delay setting is 0 seconds. The setting increments up or down by a value of 1 second. Set the delay to a positive value. 2) Select the button labeled ‘Done’ when the setting is complete. The setting value will be saved on the ‘Emails & Actions’ screen. The 'Close Popup' action can be turned off for any form by moving the slider from right to left. In the 'off' position, the slider turns grey. The option can be turned back on by moving the slider from left to right. In the 'on' position, the slider turns green. 1) The 'Popup ID' option provides a drop-down menu of all published popups ( status equals ‘published’ ). If the target popup intended to open on form submit success is not currently set to ‘published’, change it’s status to include it in the option menu. 2) Select the button labeled ‘Done’ when the option setting is complete. The option value will be saved on the ‘Emails & Actions’ screen. The 'Open Popup' action can be turned off or on by use of the horizontal slider described above. 1) Select the 'Publish' button to save changes to the form. After the form updates, the 'Publish' button will turn grey. 2) Select the close button in the upper right corner ( white 'X' on a black background ) to return to the WordPress Admin. select the 'Confirmations' suboption tab. Upon activation of a GravityForms license, the plugin includes a 'Default Confirmation' message that can be edited. Popup Maker integrates with GravityForms to add a 'Popup Maker' option tab to the GravityForms 'Settings' option. This allows users to either close or open a popup after a successful form submit action. When the 'Close Popup' option checkbox is selected (1), a hidden option labeled 'Delay' will show (2). The default time delay setting is 0 seconds. That is the time delay set by Popup Maker between the GravityForms form submit and the closure of the popup. Set the value for 'Delay' to between 3 - 5 seconds. This will allow visitors enough time to view the confirmation message inside the popup. When the 'Open Popup' option checkbox is selected (1), a hidden option labeled 'Popup' will show (2). This option provides a drop-down menu of published popups to choose from. In the example shown above, only one published popup is available to open on successful form submission. add your 'success message' to the first custom field labeled 'Senders' message was sent successfully'. 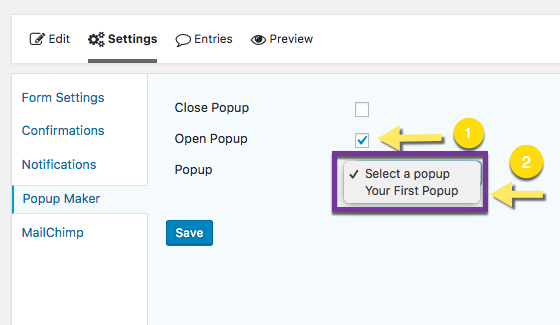 Popup Maker adds a 'Popup Settings' tab to the Contact Form 7 plugin option settings that allows users to either close or open a popup after a successful form submit action. When the 'Close Popup' option checkbox is selected (1), a hidden option labeled 'Delay' will show (2). The default time delay setting is 0 seconds. That is the time delay set by Popup Maker between the Contact Form 7 form submit and the closure of the popup.